Buy the GM5.5U, made from prime grade oak, from the online store. Three spacers come included to adapt the rest to the swing diameter of your lathe. The GM5.5U is capable of turning spindles down to 9mm and deep hollowing projects up to 220mm in diameter. It is ideal for people who have a lathe of swing 280mm or greater (we say up to 405mm but actually beyond this you use a thicker spacer). The above pictures shows the the three 44mm wide sliders supporting the three 50mm polyurethane wheels. The hardness of these wheels has been selected for a balance of support and low noise and combined with sealed ABEC 3 or better bearings so the wheels should last a lifetime. 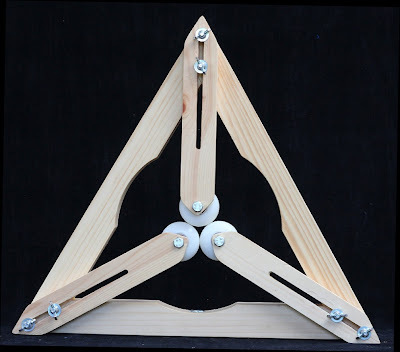 The frame is an equilateral triangle and not just for looks! The construction allows the wheels to tuck away into the corners of the frame, increasing the maximum turning diameter and reducing vibration. 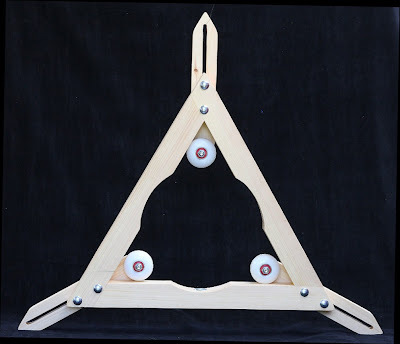 The wood in the sides of the triangle operate in pure tension, and the wood of the sliders in pure compression. The joints are glued, nailed and as if that wasn't enough the slider support bolts then clamp through them for a great big shear strength. 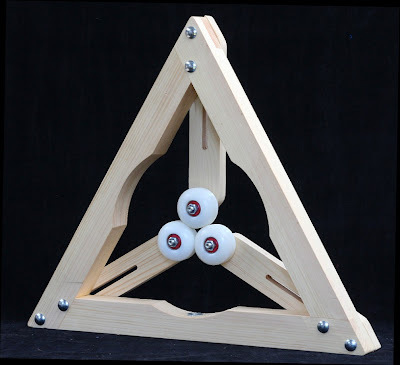 Wobble is reduced because the wheels are located within the frame- ie if the wheels were outside the frame, any forces would produce a moment rocking the steady rest back and forth down your lathe. More on this here. In addition to the three spacers, a length of threaded rod and a block are provided for secure attachment to your lathe. The thread screws into a metal insert at the base of the GM5-280 and a wing nuts tightens the frame to your lathe bars/ways. The fixing keeps the the GM5.5U very solid, as you can see from our videos.